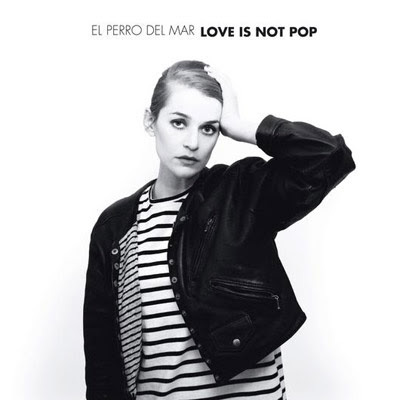 Many of the best albums this year have been from female singers or female-fronted rock bands, and El Perro Del Mar is not going to let 2009 slip away without chiming in. Love is Not Pop is the latest and most progressive of a series of delicate, beautiful pop albums by the Swedish singer (known in more layman terms as Sarah Assbring). The EP, made up completely of love songs — of love lost and love found, to be precise — is unbelievably likable upon first listen. It sounds fresher and more modern than her previous, with more electronic elements and less rigid song structures. The title, Love is Not Pop, seems rather ironic considering how much like “pop” the songs are; but the sounds are sweeter and more tripped out, broadening her horizons to extend beyond those in a hip club in the middle of Brooklyn. On the opener, “I Gotta Get Smart,” you can feel the passion, sense the sadness, and almost taste the sweetness dripping from her voice. She sounds “smarter” — almost sly and tricky — on the second track, “Change of Heart,” which aligns with the more downtempo feel of the music itself. “L is for Love” is even more mysterious, with her saccharine voice contrasting directly with synthy beats and echoing keyboards. The vocal layering is a prominent feature here and on “Let me In,” both sinister songs despite their more upbeat subject matters. “Heavenly Arms” is a nostalgic return to an ’80s feel, which is prevalent in a lot of her songs. Even those with a fear of heights will enjoy the romantic rollercoaster ride that is Love Is not Pop. Coasting below the radar of those who enjoy “pop” is a perfect place for the precious El Perro Del Mar, whose album is digestible enough for a wide range of music listeners to enjoy. With enough oomph from those in her corner, this will surely push El Perro Del Mar into the stereos of a wider audience.